OK…I bought this e-book online from a Groupon type thing (ethicalDeal, I think)…it was two books by Natalia KW…you can find more info and the books to download here ) because it was a raw book for raw cupcakes. I’ve had this coconut flour that I’ve been wanting to use but didn’t know what to do with it and along came this e-book with several recipes using coconut flour! Perfection. I’ve made 3 different flavours of cupcakes. They all have the same basic base for the cupcake and icing but with different additions to change the flavour and theme. 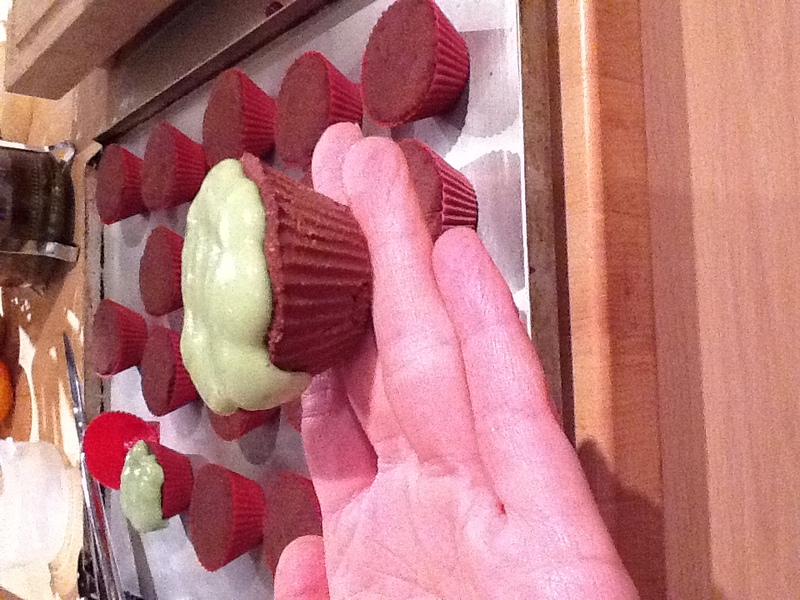 So far I’ve made basic vanilla cupcakes with vanilla icing, then I made mini strawberry cupcakes with honey ginger icing…and the most recent was the mini chocolate cupcakes with mint icing…super yum. The texture of these cupcakes is so amazing…the coconut flour is so porous that it soaks up the liquid of the other ingredients so it’s dense enough to have body but not dry…and it’s not all full of nuts. I actually think that these are the *healthiest* raw dessert I’ve ever made. I’m so excited by these and so excited by the range of flavours that I can make. SO fun! Good afternoon, my pretties. I am sitting in my bed in the middle of the afternoon because it is pouring rain outside and I am not feeling the least bit inspired to go out there into it! So, here I sit, getting stuff done that I’ve been putting off and enjoying a quiet afternoon…this time of the year can be so energized that it’s nice to have the day “off”. Even for a girl like me, who subscribes to low key holiday celebrations, the amount of energy floating in the atmosphere can be overwhelming…well, to me it is…and it finally caught up with me lastnight. So…I took class this morning but have given myself today to chill. So, I know that proportion wise I have a good body for yoga. My waist is pretty well in the center of my body and my limbs are in proportion to everything else. My neck doesn’t seem extra long to me, but I am able to bend my neck and drop my head back quite far…in fact, often further than many people…so, the question is, is the length of the neck directly related to the amount of the wall one can see behind her? This is my answer….I don’t look at the wall!!! haha. Yup, it’s true. The dialogue instruction is used as a guide, TRY to see the wall behind you…if you are trying then you are moving in the right direction and therefore getting the benefits! I posted this on FB the other day and my mom told me she didn’t understand it. I told her it was because she isn’t a Bikram teacher. Haha. That’s only partially it. I think I said that because I didn’t understand why she didn’t understand it, it seems to simple to me. Maybe it’s simple because I’ve heard Bikram say it so many times over the years. It started me thinking about what I teach and how I teach and how other teachers teach. A friend of mine told me yesterday that in the class he took, the teacher told a man to take off his watch because she would be in charge of the time. He said that the same teacher also said some kind of comment to the new person who was talking in the back…some comment about how she’s the only one who talks or something. My friend was not pleased by the comments of the teacher, he had a negative reaction to her saying these things to people and wanted to know what my thoughts were. I told him that I used to be much more strict than I am now (are some of you laughing because you think I am still very strict??! haha), but I understand now (through my own experience as a teacher and as a student) that people (in class) are doing the best they can…even if it isn’t the best I think they can…who am I to say that they are or aren’t? As a teacher, I am the guide…I tell you what to do and how to do it and if you’re lucky I will tell you the effect of doing it that way. I am not here to teach you the behaviour of your life…I can suggest not drinking water at a certain time because it may impede the posture, or I can suggest that you stand up and try again or that you wear different clothing for comfort or that you think about the meal you eat right before coming to class…I can look at your body and maybe I can see that you could go deeper or that you should ease up. I can help you with alignment and precision…but I don’t know what you feel and I don’t know what is in your body and how you are responding to the postures. That is for you to know and figure out. I teach you the postures. You have to learn about your self. Discover your self. Get to know your self. Fall in love with your self. From there, you’ll figure out what to eat and what to wear and where to stand and how often to come to class and what time you like to practice. I will use your name if I know it and I will give corrections if I see them. I will never yell at you for not doing something or “get on you” in class. What’s the point? I will teach you the postures as best as I can and in my class I will try to keep your mind in your mind for 90 minutes. What you do with that is your business. If you ever want my opinion I will be happy to give it to you…I always like to talk about yoga, this practice, how it’s changed my life over the years and what it’s taught me about myself and the world at large…but what works for me might not work for you, so this practice is to teach you about YOUR self and from there the world is your oyster…as they say.